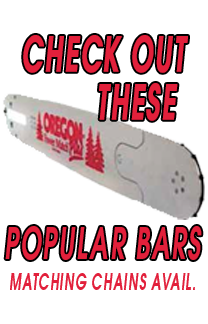 OREGON® specialty ripping chains feature a special factory grind for making dimensional boards and planks from larger timbers by "ripping" (cutting parallel to the wood grain). Recommended Saw Size: For ripping cuts only. Do not use these chains for any type of cutting other than ripping. WARNING: This chain may be capable of kickback that could result in serious injury to the saw operator or bystanders. Do not use this chain unless you have experience and specialized training for dealing with kickback. Saw chain with reduced kickback potential is available.